signed and dated 1867 lower left, inscribed “T. Henry Smith, “Blackberry Girl”, 1867, Philada” verso. Thomas Henry Smith was a painter who lived in New York, Philadelphia and Boston. He was most known for his paintings of portraits, figures and flowers. 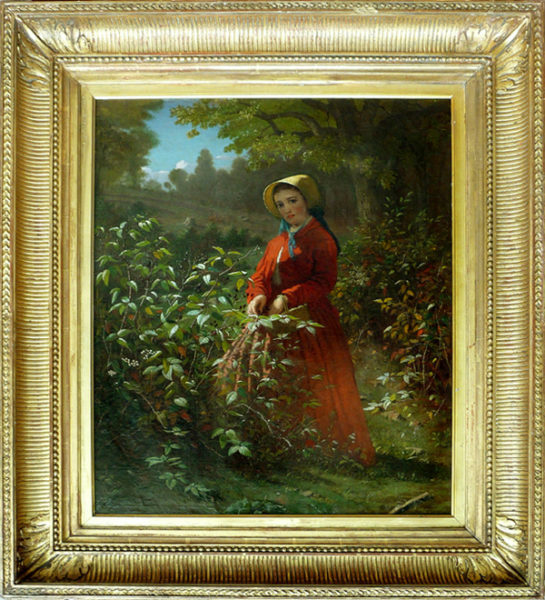 He exhibited at the National Academy Art, 1843-47, 1874; American Art-Union 1843-49; Brooklyn Art Association, 1864; Pennsylvania Academy of the Fine Arts Ann., 1876-77. His works are rare and hard to come by. Markings signed and dated 1867 lower left, inscribed “T. Henry Smith, “Blackberry Girl”, 1867, Philada” verso. Comments This painting is in excellent condition in the original gold period frame, also in excellent condition.